When I was younger and school had closed for the summer months, any kind of textbook would be the last thing I wanted to read. Give me a stack of recreational reading—adventure novels, compelling histories, or a good biography—and a shady, insect-free spot to read outdoors and I’d be good from July through September. Summer school? That was for kids who were behind or had problems learning. That spirit still tugs at me each summer, but now that I’m comfortably into my forties I also see how great the idea devoting time in summer to extra learning can really be. As someone who works in higher education, the break in the academic calendar offers a natural downtime worth taking advantage of. So this year I’m devoting myself to the idea of a constructive summer, and planned my own little summer school course in personal productivity with a few books that I’ve had sitting in a small pile just waiting for me. To make it more like being in a class, I’ll be writing about each book here on my blog as I make my way through them week by week, reporting on my progress and what I’m learning as I go. I outlined the full syllabus, such as it is, in my latest 100% Human newsletter if you would like to take part in this course with me and read along. 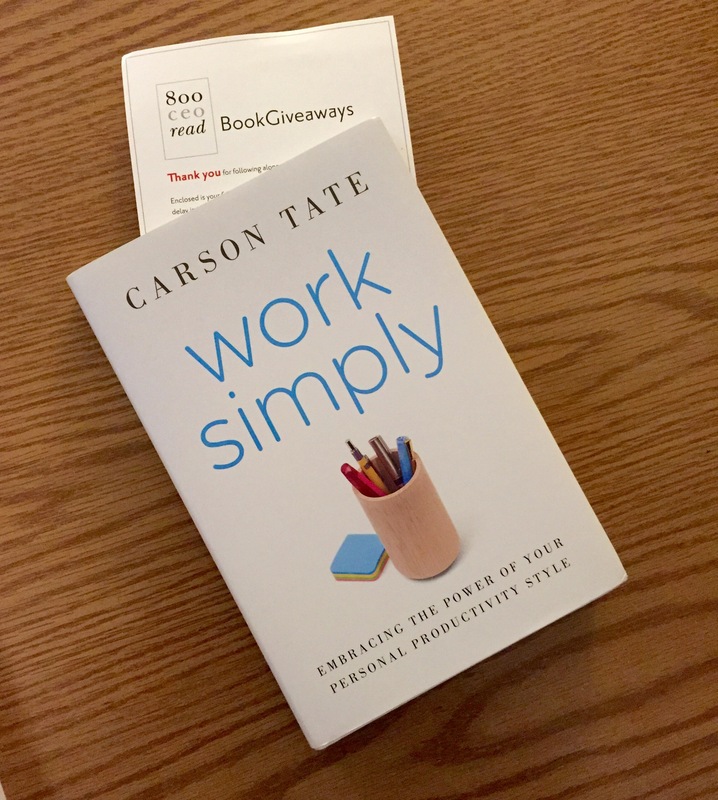 The primary idea of Tate’s book is that each of us has a personal productivity style that generally falls into one of four categories: Arrangers, Prioritizers, Visualizers, and Planners. Each of those styles has natural strengths that work best with certain kinds of productivity habits, tools, and team interactions. By learning more about what productivity style(s) I fall into, I hope to learn if there are new ideas here I can use to help me tailor the use of my time at work in a way that fits my personality and my strengths. Work Simply includes the full productivity style assessment tool, but I found myself using Tate’s free online version of the tool just to make it a little easier. Even if you don’t have the book, I recommend giving it a try here to learn more about your own productivity style. I’m just about 50 pages into Work Simply right now, which has been enough to learn that my productivity style leans mostly toward being an “Arranger” with “Visualizer” as a strong second. That feels right to me; I know I’m definitely not a “Prioritizer” or “Planner” and that’s part of why I think I’m looking for help in the first place. But I think it also puts me in good company, and it’s helpful to have some sense of where I can focus. The goal is to create a personalized productivity toolkit that is in alignment with the way you think and fully supports you as you move beyond busy to reignite purpose and meaning in your life. I couldn’t ask for more than that. Next up for me is Chapter Four, all about managing attention. This is exactly where I feel I have been weakest for most of my life, and will need the most work to improve. I look forward to reading what kind of tactics and habits Tate suggests to start making better use of my time. I’ll have more to say about this book here on the blog as I continue to read. My goal is to read 20-25 pages a day, so I should have this completed in about ten days from now. After I shared my plans for this reading project in my newsletter, I was happy to see my buddy @JesseLavery is planning to join in and read along with me – thanks, Jesse! In that spirit, I’ve started a 100% Human community on Google + where anyone else who wants to join in can share thoughts and comments about each book as we read through the summer and beyond. I’d love to have you join the conversation and see what we can help each other learn. Let’s have a #ConstructiveSummer together!